My method for storing passwords and other private information has been something of a moving target. I have recently been using Data Guardian from Koingo Software to store my private data. I have heard rave reviews of another program for storing private data, 1Password (a fact I have blogged about before). I have purchased a few licenses to 1Password and have seriously looked into switching over. The switching costs are high, though, and I haven’t made the move yet. Events from the past week have put that move on a definite timetable: as soon as possible. A couple of weeks ago I downloaded the new release of Data Guardian (version 1.3.7). This new version came with a new feature: Smart Crash Reports. Judging from the recent announcements on their website, it looks like Koingo is adding Smart Crash Reports to all their applications. Starting up Data Guardian presents this straightforward dialog. The Don’t Ask Me Again check box is supposed to prevent this dialog from appearing again even if I select the Don’t Install option. The problem is, it doesn’t work. Strangely, it works for a while. But if I let a few hours go by after I close Data Guardian, I get asked again. Yes, we added the functionality, but the bug is in the Smart Crash Reports engine, not our software. It is separate. 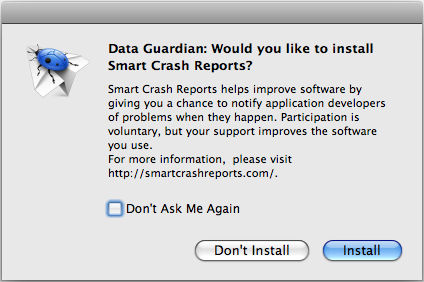 Smart Crash Reports is a product of Unsanity, a fact easily confirmed by visiting the website identified on the installation dialog. I could easily contact Unsanity. But that’s not the point. The bottom line is that Koingo added a feature to their product – a feature that benefits no one except Koingo. And this new feature doesn’t work right. Koingo should fix what it broke. That is true whether it is a show-stopper bug or something that is closer to the annoyance level (like this one). The Koingo slogan (from their website) is “Dedicated to Perfection.” It appears that Koingo’s dedication only goes so far. Perfection isn’t necessary so long as the problem can be blamed on someone else. So I have decided not to use Koingo software anymore. I shouldn’t trust an application with my data if I don’t trust the developer. Hopefully 1Password will do everything I want it to do because I am diving head first into a change. Update: Data Guardian 1.3.8 adds the following feature: “New Feature: Ability to disable smart crash reports.” I’m happy to see Koingo listen to their customers and take ownership of the problem. I think you will be very satisfied with your decision. The 1Password developers are very responsive to their customers.